Annahí Páez comes from Costa Rica, from a family of coffee growers – it's in her blood and it shows. 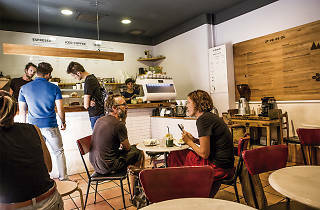 Her spot in Barcelona's Gràcia neighbourhood is the perfect ambassador for a lost corner of the world in the interior of the Central American country called Tarrazú, where her coffee, Rio Jorco, comes from, after travelling some 9,000 kilometres. Tasting it is a complete experience – it's got nothing to do with your everyday coffee; it has a thousand nuances, it's potent and subtle at the same time, and it's marvellous. The friendly wait staff at Onna Coffee are like cocktail mixologists in the way they assess what you like to make you the best blend that isn't just your usual cuppa joe. They suggest ways to infuse your brew depending on the machine they use: Chemex, V60 Dripper or Aeropress. If you aren't familiar with those at all, don't worry, they'll explain the difference. They also make flat whites and cold brews, the latter of which is coffee that drips for eight hours – during this process the maximum amount of caffeine is taken from the bean – and then served with ice. If you're feeling peckish, the pastrami sandwiches are spectacular, and the desserts are home-made. 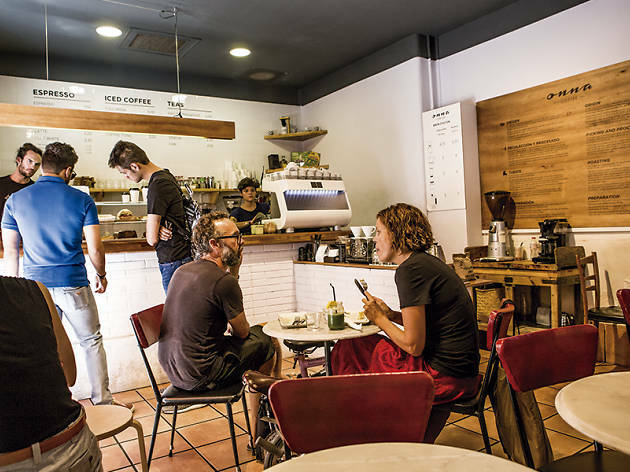 About 80 percent of their clientele are foreigners, perhaps because their signs are mostly in English and Spanish, which is great for visitors, but has a marketing knock-on effect of segregating and depersonalising Barcelona.